Applications: Secondary filtration in systems for irrigation, safe filtration. The disk filter allows high efficiency and filtration precision. It can be installed in wells, outdoors or on fertigation machines. Maximum working pressure: 8 bar at 20° . Standard filtration grade: 120 mesh (filtration available: 50, 80, 150, 200 mesh). Standard bypass: male threaded [BSP and NPT]. The filter can be supplied with the cover fitted (no discharge) or punched (with discharge) with threaded cap. Resists acids and fertilisers commonly used in agriculture. 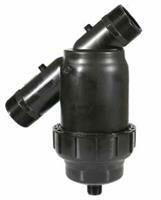 No reviews were found for Irritec - Model YFV - Plastic Irrigation Filters. Be the first to review!